Podcasting has officially replaced patriotism and prayer as being the last refuge of scoundrels. First, last year, Lance Armstrong launched The Forward, where he gets to hobnob with the kind of luminaries he probably hung out with all the time before doping (and lying about doping) got him expelled from polite society. 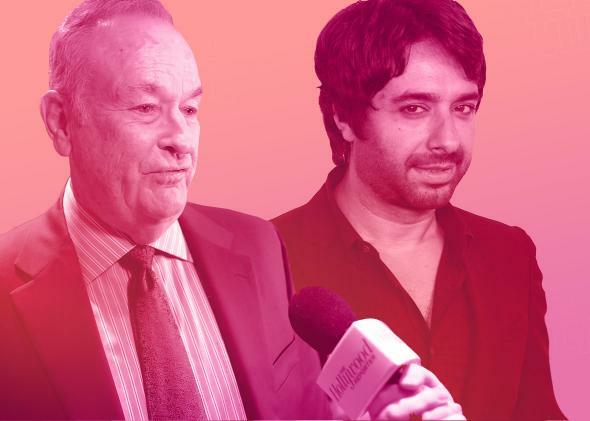 Now, in recent weeks, two disgraced broadcast stars—Bill O’Reilly and Jian Ghomeshi—have followed suit with their own podcasts. For this season’s media outcasts, nothing says “Well I don’t need you either!” like starting a podcast. Though I wrote in my review of Bernie Sanders’ podcast that the way that podcasting has diminished the role of gatekeepers is “mostly a good thing,” here’s a way in which it’s not such a good thing. It used to be the case that when people’s reputations were irreparably dishonored, whether through numerous allegations of sexual misconduct (as in O’Reilly and Ghomeshi’s cases) or by any other beyond-the-pale misdeeds, they’d get banished to the wilderness without any platform for their voice—at least, for a few years. Now, they can slip back into civilization through an RSS feed. The solution, of course, would be for all of us to simply not listen to O’Reilly or Ghomeshi’s new podcasts, and you shouldn’t—not only because of the allegations leveled at both men, but also because the shows are pretty bad. I, however, listened to them so that you don’t have to. I’ll say, though, that one reason to listen to O’Reilly’s No Spin News is to hear how deliciously obvious it is that O’Reilly hates being reduced to hosting a podcast. “I am sad that I’m not on television anymore,” he said last Monday, a minute into the first episode. For many years before this, O’Reilly posted nightly 2- to 4-minute audio rants to the members-only section of his website, but this new post–O’Reilly Factor version of the show ran 15 to 20 minutes per episode in its first week and appeared in front of the paywall. It has thus far only consisted of O’Reilly’s voice (save for one Trump clip and the occasional ding of a new email hitting his inbox) as he gives his purportedly spin-free thoughts on a few of the day’s news stories and responds to what he still calls “viewer mail” (even though there are no viewers anymore). See, I would—if I were President—I would meet with Putin. I would. I’d meet with him. And I’d look him in the eye and say, “Vlad, look. You’ve gotta stop. You gotta stop the Syria stuff. You gotta stop them arms to Iran; they’re getting in Taliban hands and killing Americans. You’ve gotta stop. And if you do stop, we’re gonna have a good economic relationship with you that’s gonna help your country and help you. And if you don’t, we’re gonna find a way to hurt ya. Who needs to fill scores of State Department vacancies when you could just listen to O’Reilly? That’s the show in a nutshell, and while O’Reilly’s staff is indeed labeling it on the website as a “podcast,” O’Reilly himself can’t even stoop to utter the word in reference to his new vessel, favoring TV terms instead, like “special broadcast” or “segment.” He seems to be learning about the technology himself as he attempts to explain it to his AARP-eligible core demo. “It’s not appointment viewing, as television is, although you’ve got the DVRs and all that,” he elucidated at the end of his maiden voyage. Though O’Reilly reluctantly conceded this point, he announced on that same episode that he is “working on making it a video display […] and maybe going into some other networks as well,” whatever that means. He also announced that last week would be the only week in which the show would be available for free. This week, he says it’s back behind the paywall on his website for “premium members” only—though, shhhh, nobody tell him it’s free on iTunes. On my own weekly podcast The Pub,I have spoken admiringly about Ghomeshi’s work as the host of Q before, particularly his handling of an infamous 2009 interview with a bizarrely combative Billy Bob Thornton that easily qualifies as one of the greatest mid-segment turnarounds in radio history. However, his dopey, faux-poetic (and often rhyming) lead-off commentaries about news, life, and culture were never my favorite thing about the show. Listening to the first four episodes of Ghomeshi’s new podcast, which consists only of those essays, I was reminded of a theory about hit shows that Audible original content chief (and former NPR programming vice president) Eric Nuzum once dropped on me in conversation. Nuzum figures hit shows are the result of the alignment of three elements: the people making the show, its content, and the cultural conditions at the time in which it is released into the world. Right people, right idea, right time. All three variables are integral to the equation, though the “stars” of hit shows often suffer under the misconception that their particular variable is the only one that mattered, and that they could experience similar success in another context, which they so rarely do. To hear Jian Ghomeshi without Q—without the show’s crack team of producers behind him, the top-tier guests they booked, the cultural “moment” the show inhabited—is to realize that there was never anything particularly special about Jian Ghomeshi. Really, it’s all right there in the name, The Ideation Project, which uses Silicon Valley-esque pomposity to make a very simple thing sound way more sophisticated and important than it actually is. Yikes, those rhymes. What makes them worse is that Ghomeshi kind of “raps” them in his quiet storm radio voice against way-too-loud-in-the-mix music that he composed himself (consisting of swirly, ambient electronica loops that sound positively Garageband). The combination gives off an embarrassing, Shatner-esque spoken-word vibe. The Ideation Project is most interesting when Ghomeshi seems, to me, to be indirectly addressing the controversy that kept him away from the mic for almost three years until now, even though he does it in a nauseating “I’m the real victim here” kind of way. The world has become a screaming match. Remember what it looks like when little kids play soccer? Oh, you know, it’s cute in that context. No one cares about taking a responsible position on the field. They rush to the ball and crowd around it without yield. They’re all competing to see who can kick it first, who can kick it farthest. And then the eager mob chases after it and surrounds the ball again. Punt and repeat. So it is with the culture of online outrage. This is social media enabled. Daily. Constantly. Everyone looking for their own kick in the hopes of more friend requests, more “likes.” Slacktivism meets fury. Heroism defined by those shouting the loudest—those forming the jury. And so, who will be the latest target? Tune in at any hour. Remember, cyberspace is an insomniac. Blust [sic] never sleeps. Maybe it’s a tabloid scandal candidate tonight, or the guy who hunted the lion tomorrow morning. Wait, wasn’t it his right to kill? Begin the debate. Just make it … shrill. The self-righteous self-pity. The rhyme of “kill” and “shrill.” I wonder if even Big Ears Teddy will listen. You definitely shouldn’t. Not just because the show isn’t good, but because the only way to stop scoundrels from using self-published platforms to rehabilitate their images is to pay them no attention.